Congratulations to Tina Miller and her newly betrothed, NFL placekicker Rhys Lloyd, on their recent nuptials. Tina and Rhys were married in a ceremony held at Don Shula's in Miami. Tina's a Miami girl, after all, so Shula's was the place to be. 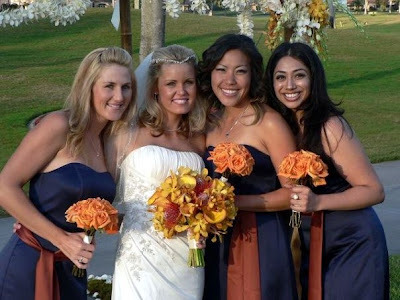 Above you see the beautiful bride with her beautiful bridesmaids, and you should recognize all of them, too: On the left, Courtney Erdman (Tina's "Big Break Kaanapali" castmate); on the far right, Nisha Sadekar, founder of Play Golf Designs; and to Tina's immediate right, Kim Kouwabunpat, who will soon be seen on "Big Break Prince Edward Island." Tina, Courtney and Kim are all Play Golf Designs golfers, too. Tina, the Golf Babes nation joins me in wishing you and Rhys and lifetime of happiness!